Hardcover with jacket, 208 pages, 13.5 x 21.5 cm, 5.3 x 8.5 in. Babies are some of the most under-appreciated beings on this planet. It is absolutely astonishing what babies are capable of from even the first day: they recognise their parents, react to faces, make eye contact, and distinguish different voices. From the perspective of modern developmental psychology, babies actively contribute to parent-child bonding. 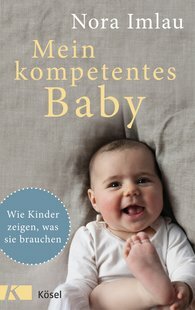 Nora Imlau’s well-researched and readable advice book clearly shows that babies possess precisely those abilities they need for their particular age and experiential world. They don’t develop from something unfinished to something finished; rather they go from being competent new-borns to competent babies and then on to competent small children. This revolutionary view of babies will help make things easier for parents, for whoever understands how babies tick will more quickly recognise what babies need in order to be well balanced and content.